When I was speaking at the Disciple Guide 2018 Church Leader’s Cruise last month, I sat down with Mark Livingston and Danny Butler for their podcast. It was fun talking to them a bit about my story, my time working with John Piper, productivity, and more. That’s the title of the message I gave at The Summit Institute this spring. They are a fantastic ministry of Summit Church (North Carolina) that equips Christians to more effectively engage in the mission of God, especially through their work. 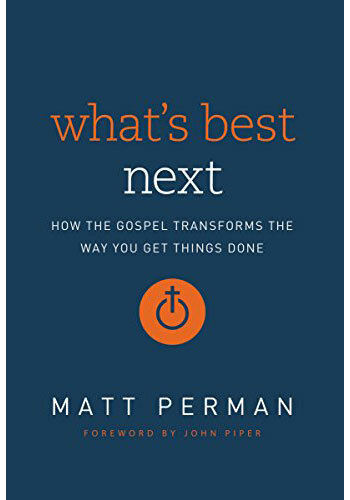 Gospel and Work | Matt Perman from The Summit Institute on Vimeo. We have been working hard behind the scenes to retool What’s Best Next for greater effectiveness. Look for new content to begin rolling out next week, along with the launch of our new website, and a greater emphasis on our coaching and other services. We will also have updates on upcoming books, courses, and more! This is a guest post by Tom Harper, author of Through Colored Glasses: How Great Leaders Reveal Reality. You can find more of his work at Biblical Leadership. If you’ve ever taken a personality test, you’ve confirmed you have certain skills, traits, tendencies, ways of working, and eccentricities that make you you. Those tests, however, only go so deep into who you really are. They can’t determine your hurts, fears, desires or goals; they don’t know what your night was like last night, or the family issue you may be dealing with. This inner life, where all our thoughts and desires occur, could be called our “first self.” The second self is the one we consciously present to the world (especially in social media), hoping to receive approval. It’s got a little more of a shine to it. There’s also a third self. We don’t know them very well. In fact, others know this person better than we do. People see each other through colored glasses. We filter, judge and label each other. Whether I’ve just met you, or have known you for years, I’ve got a biased impression of who you are. But in my mind, the person I perceive may or may not match your first or second selves. The person I think you are is your third self. But there’s a problem. You can’t control my perception, not even on Facebook! I can’t see what’s in your heart all the time; I don’t know what kind of hurts or desires you may be harboring. I make assumptions about these things. And that logically leads to another problem – you have a zillion third selves. Almost everyone that knows you has a slightly different perception of who you are. Their own filters and feelings sift your identity in ways outside your power. People’s mistaken perceptions of each other can be devastating. Recently I overheard some people talking about me, and I have to say I was humbled. But it wasn’t that kind of humility when someone lavishes praise or attention – it was the kind that took me down a notch. It helped me see how some people perceive me, and it wasn’t pretty. So how can we affect the way people perceive us? Though seeing ourselves through other people’s eyes is not easy, seasoned leaders shift and change various aspects of themselves, depending on what followers need or expect. Paul said, “To the weak I became weak, to win the weak. I have become all things to all people so that by all possible means I might save some” (1 Cor. 9:22). This requires us to get in other people’s shoes and look through their colored glasses. When we attain at least some of their perspective, we can better understand their impressions and expectations of us. It helps us see blind spots or areas where we can improve. Do we change who we are depending on who we’re with? Not at our core. We simply “become all things to all people,” for their benefit. Paul gave up his rights and customs in order to break down barriers. He risked his reputation to save people. He never changed his beliefs or who he was in Christ, but he became a chameleon whenever he wanted to reach into people’s lives and help them become like him. Identifying with the pains and joys of others is a learned skill for me. But it is a discipline that has helped me in many interactions with employees, family members and friends. Jesus saw the world around him through lenses of compassion. He saw into the heart of the demoniac, who just wanted to be free. He saw through the eyes of a promiscuous woman searching for spiritual truth. He saw with the eyes of the sick, the poor, and even the blind. When we see from other people’s points of view, we find it easier to allow for their occasional bad moods, and to overlook their offenses. We can better serve them. We feel more compassion for them. Adjusting our vision to look past people’s faults and offenses isn’t easy. But the more we do it, the more we see them as Jesus sees them. Ironically, when we start doing this, people will start seeing us differently, too. How do we effectively get people to look past their preconceived notions and see who we really are? As believers, we’re compelled to model ourselves after Jesus. He was a compassionate truth-teller unafraid to suffer for the benefit of others. In your various roles and circles in life, who do people need you to be, for their benefit? How do you think they would like you to change? At times do you wish you were more relational, quieter, more passionate, or more self-controlled? With God’s help, why can’t you become that person, inside and out? If you’re a Christ-follower, the divine third Person – the Holy Spirit – is already in you, ready and waiting to start the process of change. Ask him who you need to be in order to serve, help, comfort and lead better. Ask him to help you emulate Christ, who became like us in order to save us. This post is based on Through Colored Glasses: How Great Leaders Reveal Reality – A Leadership Fable, by Tom Harper (DeepWater Books, 2018). Available on Amazon and Audible. Beginning this Thursday night and continuing for 8 weeks, my wife and I are doing a series for skeptics and interested Christians called Questioning Christianity. If you are in the Kansas City area, we would love for you to join us! And if you can, bring an unbelieving friend or two. We will be exploring the biggest challenges to the Christian faith, and we encourage people to bring their toughest questions. Our goal is to create a safe space where people can talk about the difficulties they have with Christianity, while showing that there is solid evidence for the Christian faith. Questioning Christianity is an 8-week series where you can bring your biggest doubts, questions, and challenges with the Christian faith. This is a safe space where there is no judgment for disagreeing and honest dialogue is welcome. We will begin with a brief presentation addressing a specific challenging question or looking at the evidence for Christianity, followed by an interactive Q&A. Is there good evidence for Christianity, or do we have to take it entirely on faith? Is there good historical evidence for the resurrection of Christ? Why does God allows suffering and evil in the world? These are questions that are central to life and which many people wonder about. But it is often hard to find good answers. We want to help people wrestle through their doubts and objections, showing that there are solid answers while affirming the need for people to proceed at their own pace–without feeling pressured, forced, or judged. Every Thursday night, March 31 – May 26, from 6 pm to 8 pm. That means it begins this Thursday! Anybody with honest questions about the Christian faith. Especially skeptics and seekers, but also Christians who want to know more about why it is reasonable and sensible to accept the truth of Christianity. You can keep up to date by liking the Facebook page. Does God Care About Efficiency? Much (but not all!) 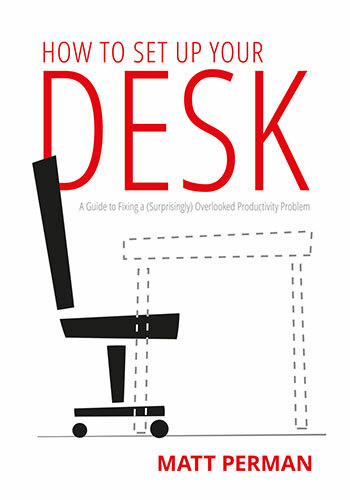 productivity literature places way too much focus on efficiency. The default thinking of many seems to be that one of our main goals in any task should be to get it done as quickly as possible with as little waste as possible. This works well with machines. But it is problematic when it comes to people, because prioritizing efficiency when humans are involved often results in diminishing beauty, quality, and discovery. (For one example, see Patrick Lencioni’s great article “The Enemy of Innovation and Creativity” which is, you guessed it, efficiency.) Efficiency has its place, but it is secondary to effectiveness and quality. This productivity principle relates to apologetics, or the defense of the faith. Sometimes skeptics look at the universe and the way God created things and critique it on the basis that it’s not maximally efficient. These thinkers are guilty of over-prioritizing efficiency. For God is far more like an artist than an engineer. Sometimes people complain that a vast cosmos is a waste of space and so would impugn God’s efficiency as a Creator and Designer. But here I’m persuaded by Thomas Morris’ point that efficiency is a value only for someone who has limited time and/or resources, a condition which is just inapplicable to God. That’s why I think that those pressing the efficiency objection are just wrong in thinking of God in terms of an engineer marshaling his resources rather than as an artist, who enjoys splashing His cosmic canvas with dazzling colors and creations. I am in awe as I look at the galactic and cosmic structures photographed by the Hubble telescope. The vastness and beauty of the universe speak to me of God’s majestic greatness and His marvelous condescension in loving and caring about us. As with God, so also with us. Care about efficiency. But care about beauty and service most of all. What is the Key to Gospel-Driven Productivity? Generosity. My post today at The Gospel Coalition. 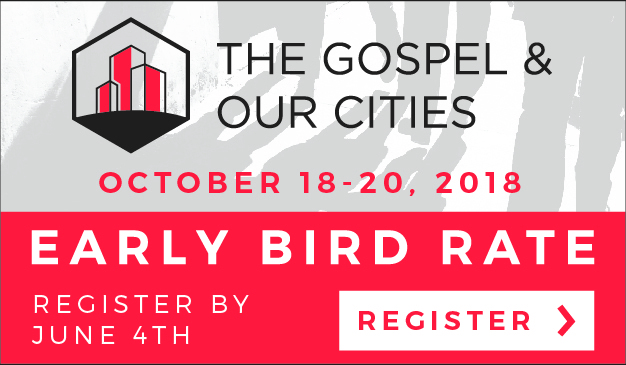 The Gospel Fund is a brand-new platform that enables Christian missionaries, church planters, non-profits, churches, and individuals to raise money for global mission ventures. I am incredibly excited about it. My friend Brannon McAllister is one of the co-founders, and he’s kept me in the loop as they’ve been developing the platform. Brannon also co-founded Noise Trade and was a key part of its growth. He understands the web, and is one of the best I’ve worked with. The Gospel Fund is the type of thing I’ve been wanting to see for a long time. It’s like Kickstarter, but for gospel-centered projects — and without the typical poor implementation and graphic design that we often see in ventures like this that are designed for the Christian world. The Gospel Fund is on the same par in terms of professionally, functionality, design, and execution as Kickstarter, GoFundMe, and similar major sites that don’t have thegospel-centered focus. I believe this can and will change the future of missions fundraising, and therefore missions itself. It is that important. Get to Know the Site! I highly suggest getting to know the site and using it! Read the about page, browse some of the projects, and if you have a project you are needing to raise funds for, consider doing it on The Gospel Fund. Beyond that, the main action right now is to consider giving to help finish the building of the site. The front end is done and the site is working. But there is back-end work that needs to be finished so that they can launch well. They are raising $70,000 so they can finish the work. It is well, well worth giving to. I highly suggest checking it out, and if you can, giving a donation. I don’t say that lightly. This is a fantastic project that is worthy of whatever you can do to help it come to completion and launch well. What is Wrong With Some of the Recent Teachings on the Authority of the Local Church? This can seem laudable in many ways, but there is a very important emphasis which often seems to be missing when people talk about this. Without this emphasis, people will inevitably misunderstand. This is why I am uncomfortable with people speaking of “being under the authority of the local church.” There is a sense in which that can be understood properly. But I’m not sure most people who speak this way are doing that. It too easily sounds like the local church has complete authority over the person, almost like a medieval monarchy. That is simply not the case. In order to understand church authority properly, it needs to be understood that the authority of the local church is a limited authority. That is, no church, no elder, no pastor, nor any other church officer can require a person to believe or do something that is not taught explicitly in the Scriptures, or deduced from them with good and necessary consequence. Which means no local church has complete authority over a person. This is an extremely important matter, which is why I avoid ever using the phrase “under the authority of the local church.” We are under the authority of the Scriptures. This does not mean the local church has no authority; rather, it means they only have the authority to require what the Scriptures themselves require. In all other matters, the Christian is free and responsible to choose his or her own course of action. Some people say “well isn’t that risky?” Which of course is how people’s freedom is always taken away. To deny spiritual freedom in the name of “well, you can’t handle freedom” is not only the road to tyranny; it is tyranny. Beyond that, it is to go against what God himself has declared. God wants his people free and has made them free. I believe one reason for this is that this is the greatest stimulus to spiritual growth. You cannot truly take ownership of your faith, and thus grow, if you think you are ultimately dependent on any other person or institution — including your local church. The local church is to assist in growth, not take control of the person. It is not healthy to see ourselves only in terms of submission. We are also leaders — leaders of our own lives. To fail to emphasize this and keep it clear is to muddle the sufficiency of Scripture, the authority of the Scripture, and the God-given freedom of the Christian. I would encourage anyone who is going down the road of this renewed emphasis on church authority to study carefully those doctrines first. A good place to start might John Stott’s chapter “Authority: Tradition or Scripture?” in Christ in Conflict.